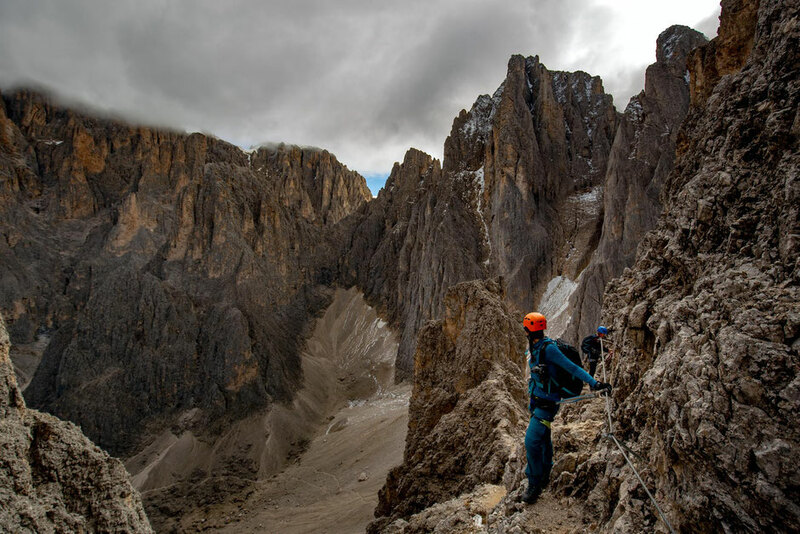 One of the first via ferratas that landed on my Italian Dolomites bucket list, because of a photograph I saw on the Internet, was the Oskar Schuster ferrata. It leads to the top of Sasso Piatto Peak in the Sassolungo group. 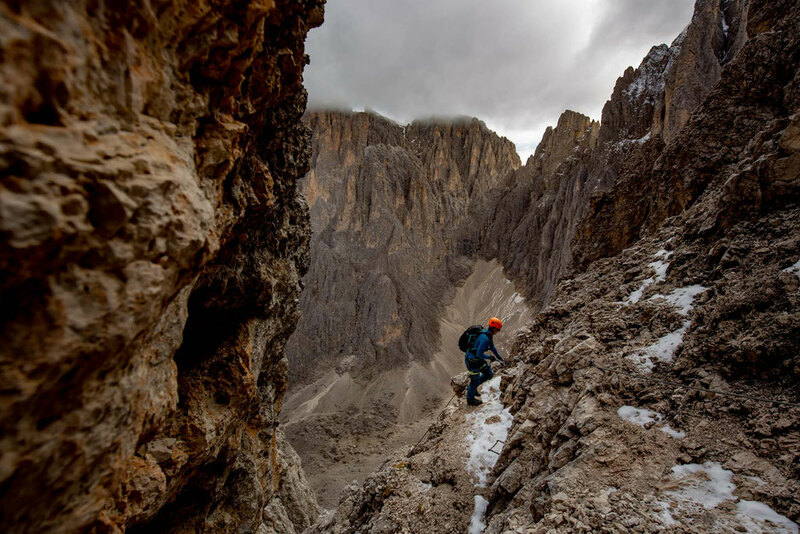 After a week-long marathon of iron paths in the Rosengarten mountain group, I gathered whatever strength and determination I had left in me and tackled the via ferrata Oskar Schuster before the fast-approaching winter would disable access to it. Was it worth it? See the photos below! Passo Sella is a high mountain pass connecting two little towns in the Italian Dolomites: Selva di Val Gardena and Canazei in Val di Fassa. You can reach the pass from either town, the driving time will be similar (between 20-30 minutes). The funny looking and slightly old Sassolungo Gondola, right near the top of Sella Pass, marks the official start of the via ferrata. I've had some difficulties finding it at first. 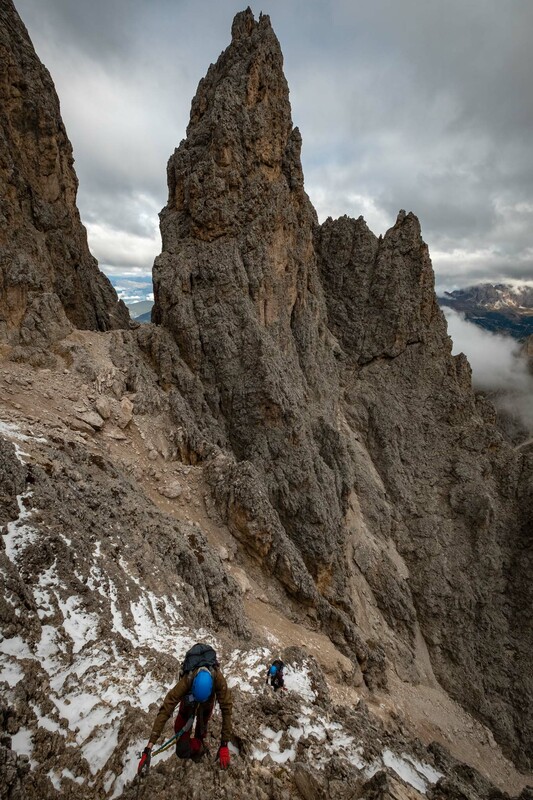 It's best to type in the Passo Sella Dolomiti Mountain Resort into your GPS. The hotel stands right next to the gondola station. If you are travelling by car, there is a decent size parking lot right near the lift. In the summer you can also take a public bus from Selva di Val Gardena. This might be a good option for those who don't feel too comfortable driving on the windy and narrow mountain roads common in the Dolomites. I have clipped my left wing mirror of my van along this road. Ask for schedules in the local visitor centre as they change with seasons. Once you make it to the bottom of the Gondola station you have two choices. One is to walk along path nr 525 reserved for the purists. The other is to jump onto the lift and let yourself be taken up to the Forcella Sassolungo. If you go with the first you will easily add 1,5 to 2 hours and 500 meters of elevation gain to an already long day. I'd recommend going with the latter and saving your energy for the fun parts. 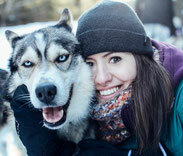 In the summer season the gondola is open between mid June and the first week of October. You will need a one way ticket and the cost is 14 Euros. 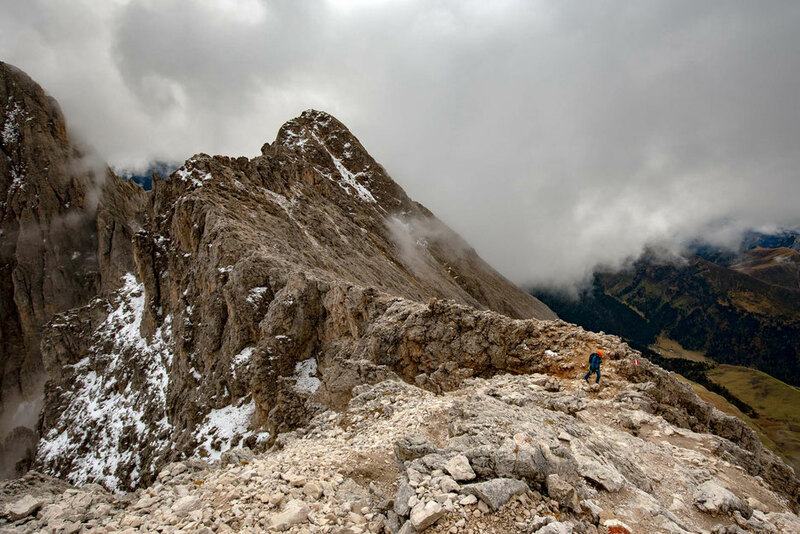 On the top of the Forcella (saddle) Sassolungo stands the Toni Demetz hut (2685 metres), where you will start your hike. You have just gained 500 metres of elevation from the bottom of the gondola and I am afraid I don't have great news for you. You will now loose most of it. From the hut follow the path nr 525 through a scree valley, signed for the Rifugio Vicenza (2253 metres). You should reach it in 45 minutes to an hour. At the Vicenza hut the path splits. 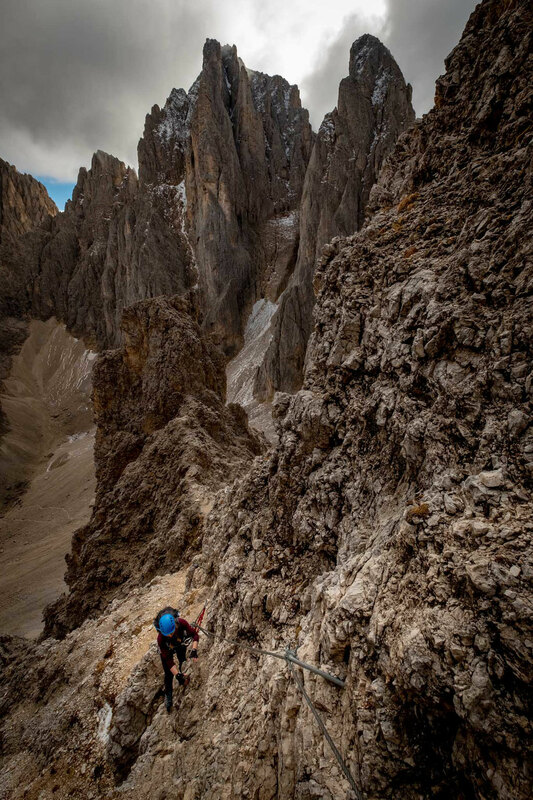 Follow the signs for via ferrata Oskar Schuster up another scree valley, parallel to the one you have just descended. You have now a little of 700 metres of elevation to gain to the top of the Sasso Piatto - the objective for today. At first you will be going up an unpleasant scree path until you reach the first cables on your right hand side. This shouldn't take longer than 45 minutes. Once you do, it's time for some fun. Make sure to look out for the red paint marks along the route. They will keep you right on track. Although the ferrata can be exposed in some places, the cable protection is excellent. As long as you always stay clipped in and watch your steps you have nothing to worry about. In some sections you will also come across ladders and stemples. They help tremendously with tackling the 90 degree angled walls. 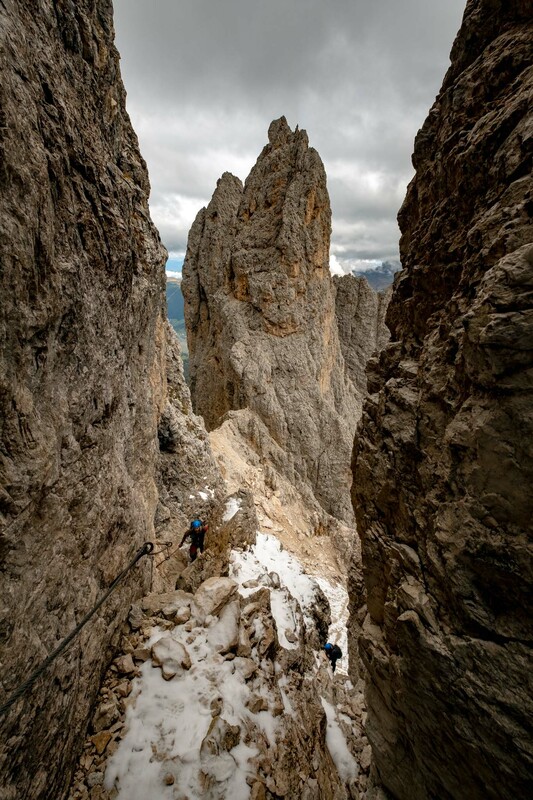 The whole scramble/climb takes around 2,5 hours, excluding the initial approach to the base of the via ferrata. Make sure to stop from time to time and look at the views! You will be often surrounded by dramatic spires, common for this group. 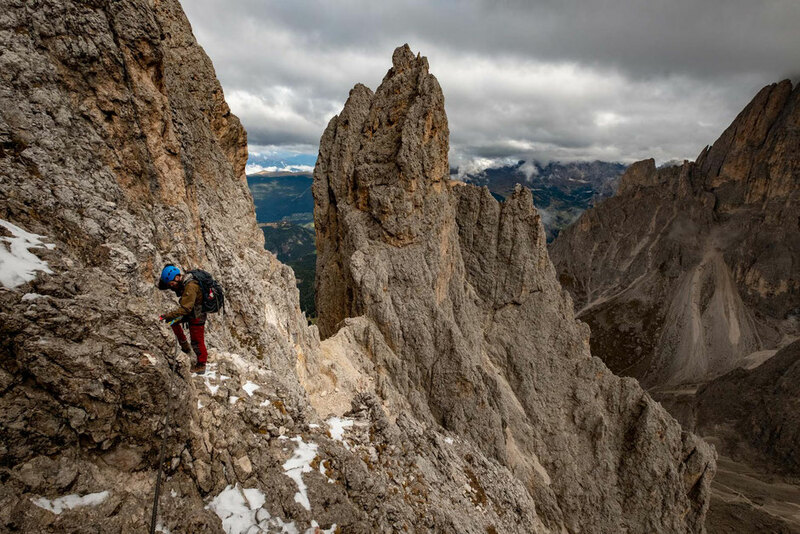 From the top of Sasso Piato you can look down toward Alpi Di Siusi, the famous and iconic photo spot in the Italian Dolomites. 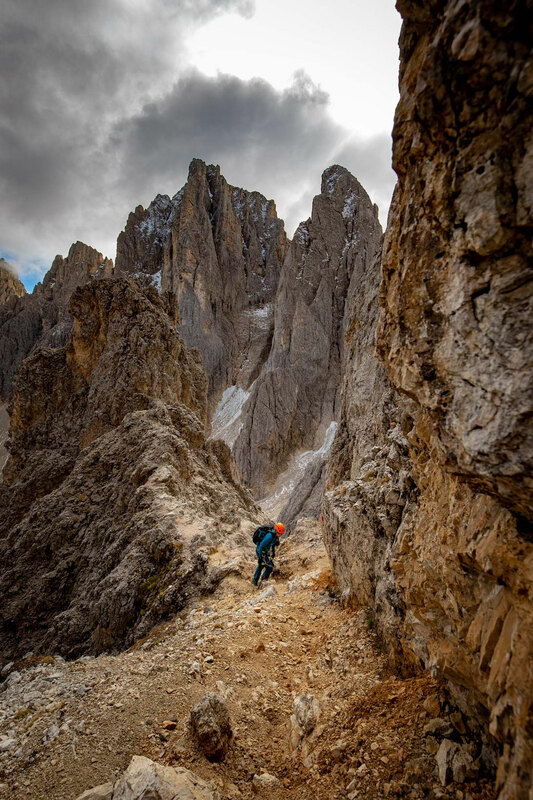 To the South West stands the lesser known Rosengarten group, where you can find via ferratas Catinaccio, Sentiero Massimiliano or Passo Santner just to name a few. To descent from the peak follow the path nr 527. To better visualise the whole route from start to finish I recommend purchasing a map. The Tabacco map nr 5 will be perfect for it, especially if you plan on exploring more of the area. The scree path nr 527 zig zags down for around 1 hour to rifugio Sasso Piatto. This is the perfect place to grab lunch and take a rest before returning to Passo Sella. From the hut take the straightforward and gently undulating path nr 557. In circa 1,5 hour you should make it back to where you started. 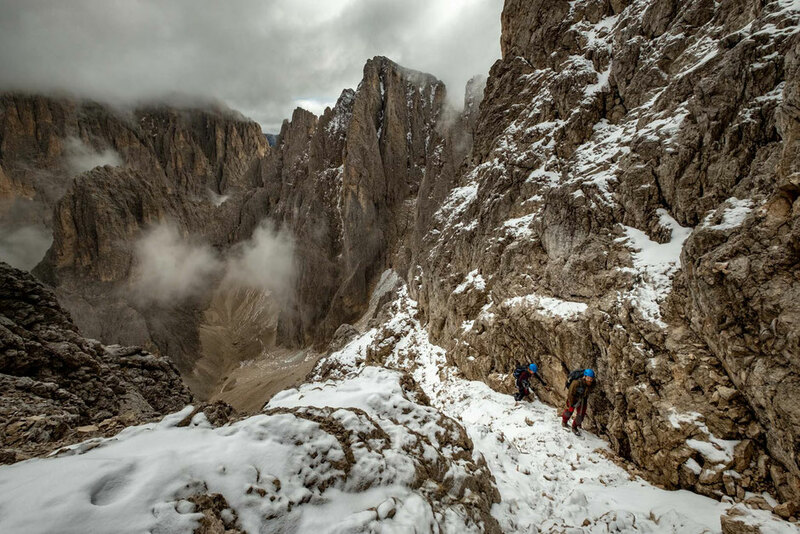 The total time to complete the via ferrata is around 6 hours. If you decide to walk to Forcella Sassolungo at the start, instead of taking the gondola, then you should anticipate to finish it in 8 hours. Make sure to leave as early as possible to avoid the afternoon storms common in the Dolomites especially between June and August. 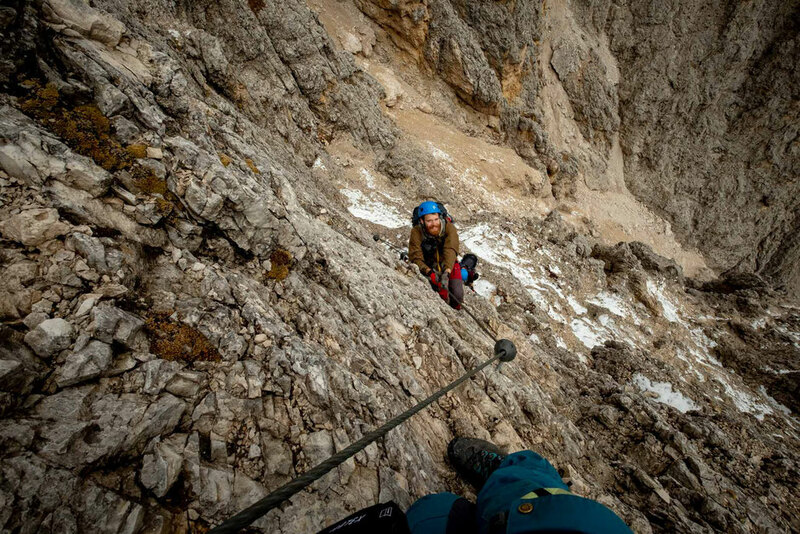 If you have any more questions about the via ferrata Oskar Schuster, feel free to comment below. I will be happy to answer.